POWERING BRANDS: Twitter #Trend Watch: Too much of the same thing? Twitter #Trend Watch: Too much of the same thing? For brands trending on Twitter is the new Facebook app – a big check-in-the-box. Just today there were 4 promotional trends (I kid you not!) which says a lot about how everyone is jumping on the bandwagon. 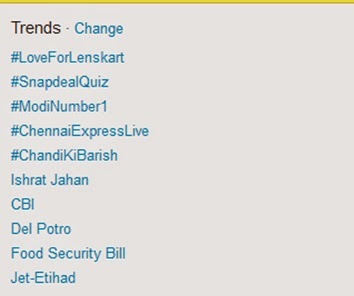 Here is a snapshot on the trends. @lenskart_com conducted a contest with sunglasses as giveaways. Participants needed to use the hashtag, answer 10 questions, tag 5 friends and RT all the questions. #Phew! @snapdeal ‘s quiz (again with 10 questions) was less intrusive. Participants needed to answer the questions using the hashtag and 10 winners would be gratified with 8gb pen drives. Another quiz hosted by @bullionindia with 10 questions where each one of them had to be answered and 3 winners would be chosen. And the most unimaginative Twitter contest was conducted by @_tseries to promote the Chennai Express Music launch which also had a live webcast on Youtube. Participants had to follow the handle, tweet with the hashtag and that’s it. Forcing trends through Twitter is plain annoying. Imagine being tagged in a nondescript contest and being spammed on your timeline by friends with multiple RTs and following a brand twitter handle that spams contest tweets indiscriminately on your TL. The nature of these templatized contests/trends seems ad-hoc and generic. All of them appear the same. IMO brands need to invest in creating a social media presence that pulls and stop resorting to slapdash tactics that do nothing for them.